Last month, I applied for several new credit cards and decided to apply for them all on the same day in one “app-o-rama”. While it’s true some people are shifting away from the app-o-rama idea and applying for cards as needed, I stuck to it as historically it’s worked very well for my wife and I. Now before I get into the detailed results, please note I post about my credit card dealings as these posts are always popular with readers but remember just because I apply for a card (or 4) doesn’t mean you should. In fact, you probably shouldn’t as I know what I am doing and the risks associated with these financial decisions. We are at different places in the miles/points game and probably have different travel goals/needs. With that disclaimer out of the way, here is what I applied for and why. Update (6/18): Some people might see an offer for 40k points the first year + 25k points the second year by clicking this link. Personally, I like the 50k offer below better since I never have to pay an annual fee but some people might appreciate the extra points. I find it interesting that while I’ve had 47 credit cards (yes that’s the actual number though many of them are now closed) over the past 4 years, I never had the American Express Premier Rewards Gold Card which is a fairly popular card. The normal signup bonus is just 25,000 points but I was able to get a 50,000 point offer to appear by opening this link in a Chrome incognito window. This offer required spending spending only $1,000 in 3 months and the annual fee of $195 was waived for the first year. I was not approved right away but instead of calling reconsideration right away, I waited a day and found out I was approved when I checked my application status online. In addition to the 50,000 points, this card offers a $100 airline credit annually based on the calendar year so in the first year of card membership I will be able to utilize this credit twice. I have already used this year’s credit to buy 2x $50 Delta gift cards and I plan to repeat it in early January 2017. Currently, when I click the link for the card above (remember not everyone will see this offer right away or at all), it shows a 50,000 point offer but with a $2,000 spend requirement – still a great offer in my opinion especially as Amex limits you to a card once a lifetime so you want to maximize the signup bonus. There are reports of very targeted 60k or 75k offers but they are quite rare so I think 50k is the realistic highest signup bonus for most people. My general focus for this round of applications was to accumulate transferable points (like Chase UR or Amex Membership Rewards) or airline miles as I have plenty of hotel points right now (over 1.3 million across all programs between my wife & I) so I went for one of the highest signup bonuses with this card. I did unfortunately miss the 100,000 Avios offer earlier this year but I wasn’t confident it would return anytime soon so I pulled the trigger on the 75,000 Avios signup bonus offer. Technically, the offer is split with 50,000 Avios being awarded after $2,000 in spending in 3 months and the other 25,000 Avios being award for spending $15,000 total in the first year. Additionally, the annual fee of $95 is NOT waived for the first year. Chase is known for the lack of instant approvals and this was no different as I was notified my application was pending. I decided to not call reconsideration as I already had 5 Chase cards open (4 personal, 1 business) and I was worried about having another set of eyes on this application/all my Chase cards and have an overeager agent possible deny my application under the 5/24 rule even though 5/24 does not appear to apply to this card. After waiting it out for about 25! days, this is how I found out I was approved – I got a thick envelope in the mail from Chase. This is how I found out I was approved…thanks Chase! Going back to the offer, I’ll easily reach the $2,000 spend threshold in 2 months and I have a year to tackle the remaining $13,000 in spend required for the other 25,000 Avios. This won’t be an issue as I will put all non-bonus category spend on this card and I’m sure there will be several reselling deals or smaller manufactured spending deals to help complete this spend. With these Avios, I will plan to exclusively use them on short haul American Airlines flight domestically and to the Caribbean. Before I go into this offer, note the offer on this card has increased now to 30,000 miles + $100 statement credit and you can apply directly via this link. Back when I applied the best offer was 25,000 miles + $100 and even though I knew the 30,000 mile offer was coming at some point this year, I chose not to wait for it. I won’t describe my thoughts on churning these cards in this post as that deserves its own post (which I will write someday) but at a bare minimum I like to signup for at least 2-3 of these cards a year (and some people do much more than this). The timing made sense to get this application in now and I was happily instantly approved. Anyway back to offer which was 25,000 miles for getting approved for the card (no spend requirement) plus a $100 statement credit if you spend $1,000 in 3 months. There is also a free companion ticket though I have never used mine as I’ve never actually flown Alaska Airlines. The annual fee of $75 was NOT waived for the first year but with the statement credit offer, Bank of America was paying me $25 to acquire 25,000 Alaska miles. Even with the demise of Emirates first class awards (yet another post I need to write – my review of Emirates first class), Alaska miles are still valuable for awards to Asia on Cathay Pacific/Hainan Airlines, awards to the South Pacific with Fiji Airways and great in general for awards on Delta, American or Alaska themselves. In short, I will have no problem spending these miles. Update (6/18): This card now offers a 30,000 mile signup bonus. The offer for the Alaska Airlines business card is quite similar to the personal card except it does not include the $100 statement credit to help offset the $75 annual fee which is NOT waived for the first year. Currently, the offer is still 25,000 miles but I’ve heard it will be increasing to 30,000 miles relatively soon to more closely align with the personal card. Just like the personal card, this card is indeed churnable and one that I like to acquire 2 or 3 of in a year to help augment my Alaska Mileage Plan balance. Additionally, if you apply for the the personal Alaska card at the same time, the credit inquiries will be combined thus creating almost no downside to adding a business card application. For this application, I was instantly approved. For this offer, the 25,000 miles are awarded after first purchase so I tend to think of this offer as a way to buy 25,000 Alaska miles for $75 – an obvious good deal. Even if you don’t have plans to redeem Alaska miles for a luxurious flight aboard Cathay Pacific or Emirates, at the very worst you can think of this offer as buying a domestic flight for $75 since those 25,000 miles will cover domestic round-trips on American, Delta or Alaska. This was yet another successful round of credit card applications especially when you consider I did not have to call reconsideration on any of these cards and there were no denials. For a total cost of $145 in annual fees the first year (after factoring in the $100 statement credit on the Alaska Personal card), I earned 175,000 points/miles and $200 in Delta Gift cards. That’s a pretty solid haul in return for 3 credit inquiries and shows that even after 47 cards, there is still much value to be earned by chasing the right signup bonuses. *As always, there are no affiliate links included in this post. All links lead to the best available offer I am aware of. I just got an email from British Airways stating that starting February 2nd, 2016 award flights that occur in North America that are under 650 miles, will increase by 66.67%. 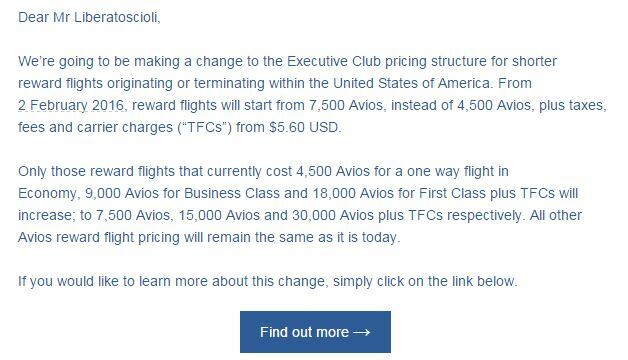 In other words, any award flight that cost 4,500 Avios today will now cost 7,500 Avios. It is important to note this is for flights in North America only – you can still find 4,500 Avios award flights in other parts of the world. Here is the official notice from British Airways. Economy class flights that touch North America increase from 4,500 Avios to 7,500 Avios. Business class flights that touch North America increase from 9,000 Avios to 15,000 Avios. First class flights that touch North America increase from 18,000 Avios to 30,000 Avios. It is interesting to note that this is the ONLY devaluation made and it is only for a very specific set of flights (under 650 miles, North America only). Basically this tells us BA has seen a surging number of redemption for these short flights on American Airlines and wants to curtail that activity slightly. I think even at 7,500 Avios this still represents a great deal for most travelers, especially when using Avios to get last minute tickets which are usually several hundred dollars. I appreciate the advance notice from British Airways but I’m slightly miffed at the timing of this as my wife just applied for British Airways 100,000 Avios offer. I’m not sure I wouldn’t have gone through with that offer but it’s slightly disingenuous to offer a large credit card bonus for the US market and then weeks into the promotion, make a change that only affects the US market. I guess I should be happy nothing else has devalued but that still doesn’t make me a happy camper this morning to see their best award devalue by almost 67%. 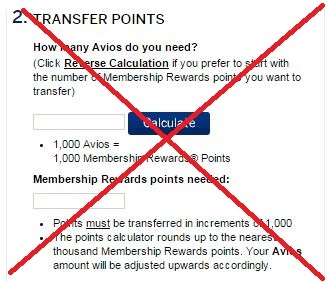 Starting tomorrow, October 1st, the ratio to convert American Express Membership Rewards points into British Airways Avios will increase from 1000:1000 to 250:200. In other terms, transferring the same 1,000 Membership Rewards Points will only net you 800 British Airways Avios starting tomorrow (10/1). It is important to note that the transfer ratios from Chase Ultimate Rewards (1:1) and Starwood (1:1, could be 1:1.25 if done in 20,000 mile increments) remain unchanged and are obviously more favorable going forward. This is an unfortunate devaluation for me as my main use of American Express Membership Rewards points were transfers to British Airways for short to medium length flights on American Airlines domestically or the Caribbean. I’ve been struggling with how many, if any, points I should transfer over before the ratio changes as between my wife and I we are sitting on close to 400,000 Membership Rewards points. I’ve also transferred MR points to Delta and even Hawaiian (though that won’t happen again) in the past so I’m not totally dependent on using them for British Airways. Furthermore, there are additional partners such as Singapore or Air France where I could see myself transferring a fair amount of points for a premium cabin award in the future. My real hesitation for transferring points now is I lose the one aspect of these points that make them so valuable and that’s the flexibility component. 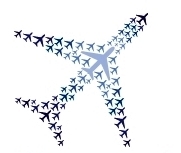 Membership Rewards points can be used for flights across all 3 major alliances + several independent carriers (JetBlue, the Virgin family etc) so I’m struggling with the idea of tying up a good amount of these points for a very specific use – American Airlines flights either domestically or to the Caribbean. On the flip side, I don’t think I’d want to transfer Chase Ultimate Rewards or Starwood points over unless I needed to top off my account for an award flight. I use all my Chase UR points for Hyatt/United redemptions since there is no other feasible way to obtain a mass amount of points for those two programs. For Starwood, I’ve been using points for transfers to Alaska Airlines or for hotel stays at mid-tier Starwood properties which can represent a great value. In the end, I decided to transfer a very small amount of my overall MR balance to British Airways. My wife just picked up the 100k British Airways Avios offer and combined with our existing balance of Avios, I decided to “top off the account” so I would have enough Avios to cover several roundtrip flights on AA. The amount transferred was less than 5% of my MR balance so not a huge number but enough to make me feel comfortable based on my projected future travel needs with Avios. In the event I need more Avios down the line, I can always hope for an Amex transfer bonus, dig into my Chase or SPG stash or if those aren’t realistic options just bite the bullet and transfer points at the devalued ratio. It’s not such an easy call to speculatively transfer points without an actual use for them so I’m curious is anyone making a speculative transfer today ahead of the deadline? 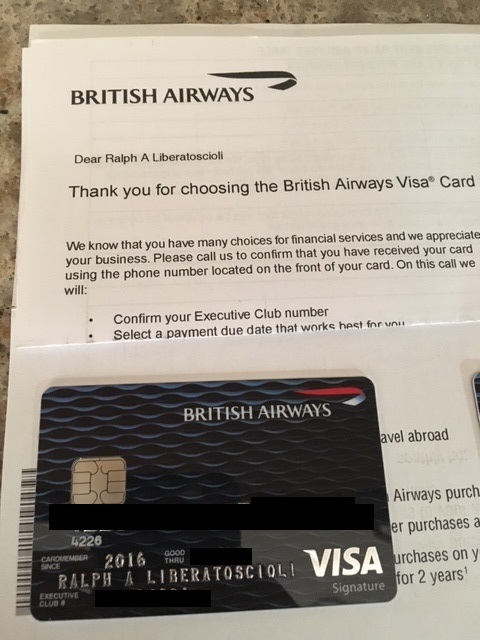 I know you’ve most likely heard about the new 100,000 Avios offer on the Chase British Airways Visa credit card already but I wanted to share a few thoughts on it, specifically on a few different items to evaluate before applying. A lot of digital ink has been spilled expressing how amazing this offer is and while I agree it is a good offer, I’d like to express some words of caution because this offer is NOT for everyone. As you can tell that is a LOT of spending to take full advantage of this offer and unlike the normal offer on this card (which is 50,000 Avios for spending $2,000 in 3 months with the annual fee WAIVED) this offer does NOT waive the annual fee. While a 100k offer is normally great, here is a list of items to consider before applying for this card. This is probably the most important point to make. As I mentioned above, the normal offer on this card has the annual fee of $95 waived and you can earn the same 50,000 Avios from this offer (this offer is still available here). If you gamble and think you can spend this much but fail, you would have paid a $95 annual fee on this offer for no reason. Please make sure you have a plan to meet this large minimum spend. Do You Fly American Airlines or Alaska Air? It might sound funny to those who aren’t already aware but you don’t actually want to use these points to fly British Airways. That’s because British Airways will tack on hundreds or thousands of dollars of fuel surcharges on award flights on their metal (and most of their partners with some exceptions). Instead you should plan on using these points on American Airlines/Alaska Air domestically or to the Caribbean/Mexico. Since British Airways’ award chart is based on the distance of the flight, a 100,000 Avios can go a long way. 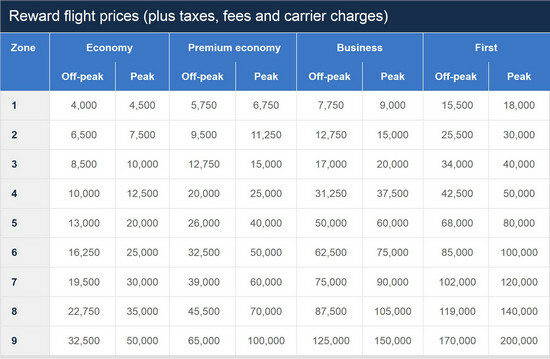 See the chart below for flight costs. Basically, if you don’t plan on using a good portion of these points for American or Alaskan flights, I’d rethink if this is the right offer for you. P.S. Yes, I am aware of other good uses of Avios (US to South America, Australian domestic flights etc.) but practically speaking the majority of my readers would be using these points for AA or Alaska Air flights. Assuming you are not into manufactured spending, most people would need to use this card full time for a while to meet the minimum spend requirement. Since this card only earns 1 Avios per dollar spent with no bonus category (except for 3 points per dollar spent on British Airways), you are giving up 2x, 3x or even 5x points earned in certain categories. Without knowing your personal situation and spending habits, does it really make sense to put all your spending on a 1x card whose points have limited usefulness (as described above)? Of course only you can answer that question. I don’t mean to sound so negative about this offer as I think this offer works for the right individuals – in fact, I plan to apply for this card myself. I posted this because I know a lot of people are going to see “100k offer” and think it is amazing (and a lot of blogs have written as such). My advice is to analyze your personal situation and ask yourself if it really makes sense for you. I think the four points I presented above are a good starting point for this discussion and if you find yourself wavering on a few, rethink whether this offer is good for you. The old offer of 50,000 Avios with no annual fee for the first year is still available as well.